Posted On: 21st January 2019 . A tempting ‘cook’s perk’ for some, but raw cookie dough hasn’t had the kind of treatment that’s designed to kill germs, so may cause illnesses in people who eat it. 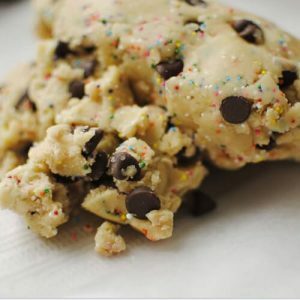 The Centers for Disease Control and Prevention (CDC) recently issued a warning about the dangers of eating raw cookie dough, urging us to “Say no to raw dough!“. It would be easy to just associate the health risks with the inclusion of the raw egg that’s in the raw cookie dough, as this is a well known cause of Salmonella, but it should also be pointed out that the flour itself may also present some health risks. The flour that is contained in raw cookie dough isn’t usually treated to kill germs, such as those that can cause Escherichia coli (E. coli). It is these germs that can contaminate the grain whilst still in the field or, for that matter, at any other stage during flour production. It is only really the process of cooking the flour that kills the harmful bacteria. In 2016 there was a serious E. coli outbreak linked to raw flour, which saw 56 people, across 24 US states, affected. No-one who became ill from the flour or flour-based products died, but one victim suffered kidney damage and 16 others were hospitalised. A number of these said they had eaten or tasted homemade batter or dough before becoming ill. 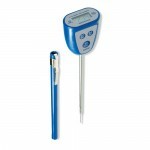 Designed for today’s busy professional and home kitchens, our range of Pocket Digital Thermometers are here to help!